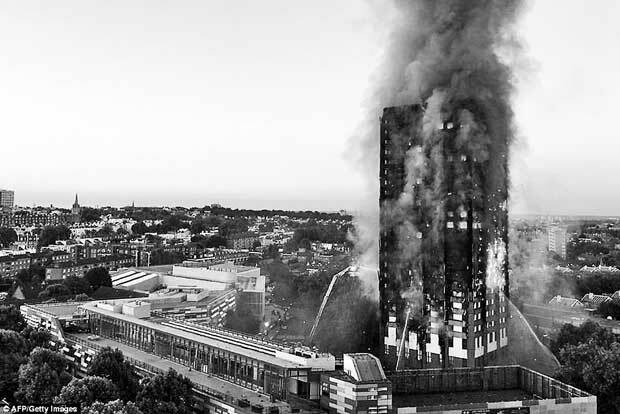 n June 14, 2017, London’s Grenfell Towers, owned by the Borough Council in Kensington and Chelsea (Local Government Authority), and managed by an independent company - Kensington and Chelsea Tenant Management Organisation (KCTMO), went up in flames. The building was refurbished by a third party - Rydon Construction - who were contracted by KCTMO at a cost of £10 million recently. Rydon Construction, while refurbishing the building with full knowledge used a flammable cladding imported from the USA to cover the walls of the 24-storeyed building! This material is banned in multi-storyed buildings in the United States. But… and it is a big but, the material used is cheaper than the fireproof cladding put out by the self-same US-based company. It would have cost 5,000 Sterling Pounds extra to cover the walls of the building with fireproof cladding. The building was covered in panels with a plastic core costing £22 per square metre - just £2 cheaper than the fire-resistant version. The inferno, which resulted completely gutted the building. At least thirty people were known to have died. The exact number is still unknown and rescuers expect the final toll could be much higher. Seventy persons are still to be unaccounted for and the housing block was home to at least 500 residents. It is the poorer sections of British society, who occupy government/local government housing complexes and it is as always happens, these poorer sections of society who are subject to the vagaries of the rich and mighty in their search for super profits. A sum of £5000 could have prevented the fire from spreading and literally roasting alive, those trapped in the blaze. The PE panels used at the Grenfell Towers conformed to UK standards but are rated as ‘flammable’ in Germany. These are man-made disasters. They are created in the pursuit of illegal profiteering. In the case of Grenfell Towers, even a cursory glance exposes a number of miscreants in this search for mega profits. Firstly the management company and the Borough Council in Kensington and Chelsea that did not pay heed to residents’ complaints to the fire risk. Then the Government of Britain and deliberate decisions by the Ministers to delay upgrading fire regulations and plans that have emerged to opt out of EU building standards as a Brexit bonus. Rydon Construction, which used substandard material construction material to gain a few Pounds more. And the US manufacturer who continues manufacturing flammable construction material despite the danger they pose. The US government too cannot escape responsibility. Being fully aware of the danger this material poses, it continues to give licence - not only to manufacture such construction material, but permits it to be exported all over the world. All for the sake of profit. But the mad chase for profit at any cost is not limited to the so-called ‘Rapacious West’. A few months ago, a mountain of garbage at the Meethotamulla garbage dump collapsed on a number of houses, burying alive residents including women and children. Despite the residents’ protests that the massive garbage pile was not stable, both the Central Government and Municipal authorities did nothing to address the situation.The victims here, were once again the poorer sections of society; but who cares for the poor? The Waste Management Authority has the capacity to degrade garbage, but no alternative land was provided by the Urban Development Authority (UDA) to help the Authority set up its plant. According to Public Health Inspectors (PHIs) and Municipal and Urban Council Authorities, the UDA has extensive lands at its disposal and is acquiring yet more land. A garbage mafia with tentacles reaching the highest in power is preventing the degrading and disposal of garbage, they charge. It could have been possible for the Colombo Municipal Council to avert the disaster at Meethotamulla, but for these reasons they failed. Goddamn the poor. They are only needed at voting time.